Well, the evening for Deadspin readers at RFK Stadium was Monday night, and we'll say this: We woke up just in time to do the site this morning. We had an excellent turnout, and we were deeply honored to meet some of our finest commenters around these parts, including many of the All Star crew behind Kissing Suzy Kolber. We are proud to report that the average Deadspin reader is as intelligent, charming and drunk as we anticipated they would be. Yeah, about the drunkenness: It might have been the intense humidity, but the evening led itself to several blackouts and even, we hear, the first ever Deadspin commenter hookups, which is what we're all about here: Bringing people together. Through alcohol. 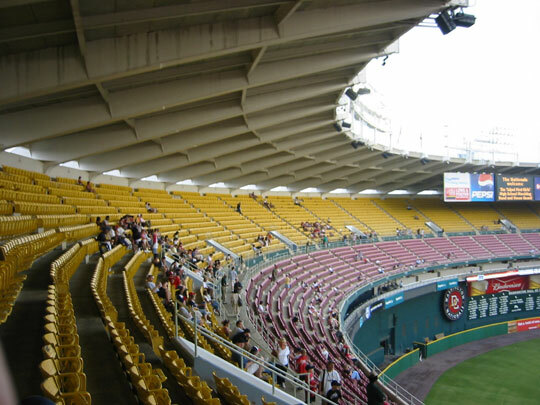 Anyway, here's a photo of our section; you can tell, it was a packed house at RFK. We'll surely have more photos later on, but that'll hold for now. Thanks everyone for coming, and we're totally going to have another one of these. If our livers can take it.